On Labor day weekend my wife went on a beach trip with some of her friends and I was left to my own devices. Since I didn’t have much planned for the weekend I went to the mall to walk around and have lunch. As I was walking through the mall I saw a hat embroidery shop and litterally felt a pull towards the entrance of the shop. When I left the shop I had in my posession an almost royal blue hat with the words “Tell me your Testimony” embroidered across the front of it. That hat made a huge difference this past weekend when I went to the Christian Motorcycle Association (CMA) Rally at Lake Williamson retreat center in Carlinville, Illinois. I spent most of the afternoon hanging around with the group of people from the O’Fallon Illinois CMA chapter. Most of the folks I hung around with were from the local CMA chapter and are people who I’ve socialized with or spoken with at church. The CMA rally allowed us to talk and get to know each other even more, but interestingly enough the hat didn’t make much of a difference amongst people whom I already knew. It was a different story once I got away from people that I’d been socializing with. In less than 20 minutes I had three people pull me aside and ask me about my testimony and two of them told me their own testimonies of what Christ had done in their lives. 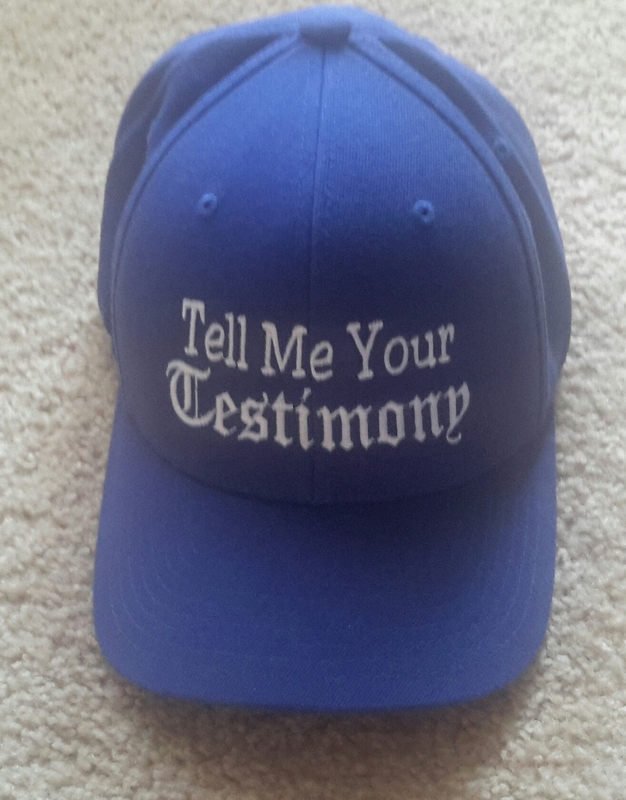 A gentleman named Bubba started everything off when he looked me dead in the eye and then threw the words on my hat back at me when he said, “So… Tell me your testimony!” I grinned at him and replied, “It says,’Tell me your Testimony, not ask me about mine! '” The teasing smile that creased his face made me realize that the next few minutes of my life were going to be good. Lifting his eybrow slightly he whimsically replied, “You tell me yours and I’ll tell you mine!” “Fair enough.” I said and then procedued to tell him how God had healed me following my back surgery for a broken back; not just physically, but how I’d been humbled during that timeperiod of my life. During that time I went from feeling as though I was an active, healthy vigorous man to a weakling who could no longer support or care for his family the way that they needed to be taken care of. God used that trial to mature me and helped me learn to trust not just Him, but in the fellow Christians who helped me and my family during that time. Then I told him that it didn’t just end there! I explained that the experience with my back brought me closer to God and showed me the numerous blessing that he’s given me to include, most recently, two promotions at work. When I’d finished speaking Bubba looked at me and told me how God had healed him of two different forms of cancer that had occured years apart from each other. He even showed me a tatoo that he’d designed that showed him holding the sword of God conquering a dragon. It was such an amazing story since he explained that the dragon symbolized the cancer that had been killing him. When Bubba finished I looked at the gentleman standing next to him and after looking at his nametag I asked, “So what’s your testimony Jose?” He was hesitant at first but one of his friends looked over at him and said, “What’s the CMA say? You should have a testimony that you can tell in 3 minutes or less?” I could almost see the change come over him as he made the decision to tell me his testimony. His back straightened, he held his head up, and he looked me directly in the eye as he confidently explained how, before Christ, he had held everything inside; never expressing any emotion. Then a smile flitted across his face as he began to tell me of his wife and family. He became very serious as he explained how she had gone to church and had prayed for him for over two years. That smile came back to his face as he then began to talk about accepting Christ and the dramatic changes that acceptance had made to his life and more importantly in the lives of his family. What was even more enjoyable about the situation was that just as he finished telling me his testimony his wife walked up and I was able to tell her that her husband had been telling us how important she had been to his salvation. So in the end listening to God during my prayer time and purchasing a simple hat with the words “Tell me your Testimony” opened the door for me to be able to listen to multiple people; some of whom shared their testimonies with me. That is the true blessing of this story; the fact that a simple tool was used (the hat) to open a dialog between fellow believers. By using the gifts that God has given me and listening to their testimonies instead of just telling my own I got to experience the joy of watching other people talk about God and see the look of peace and comfort on their faces as they shared the stories of the amazing changes that He’s wrought in their lives.